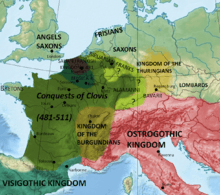 Clovis (Latin: Chlodovechus; reconstructed Frankish: *Hlōdowig; c. 466 – November 27, 511) was the first king of the Franks to unite all of the Frankish tribes under one ruler, changing the form of leadership from a group of royal chieftains to rule by a single king and ensuring that the kingship was passed down to his heirs. 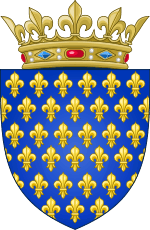 He is considered to have been the founder of the Merovingian dynasty, which ruled the Frankish kingdom for the next two centuries. 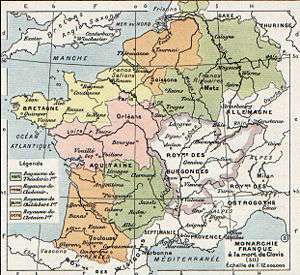 Numerous small Frankish kingdoms existed during the 5th century. The Salian Franks were the Frankish tribe that after 274 had occupied the area south of the lower Rhine known as Toxandria, roughly the current province of North Brabant in the current Netherlands and the provinces of Antwerp and Flemish Brabant in current Belgium. After the collapse of Roman power in the last days of 406 the Salian Franks had expanded to the area south of the military highway Boulogne-Cologne. The powerbase of Clovis father was the area around Tournai, in the current province of Hainault, along the modern frontier between France and Belgium. Upon the death of his father, Merovech in 457 Childeric I, Clovis' father, became king of the subgroup of the Salian Franks based around Tournai. In 463 he fought in conjunction with Aegidius, the magister militum of northern Gaul, to defeat the Visigoths in Orléans. Childeric died in 482 and was buried in Tournai; Clovis succeeded him as king. Under Clovis, the Salian Franks came to dominate their neighbours, initially aided by the association with Aegidius. Historians believe that Childeric and Clovis were both commanders of the Roman military in the Province of Belgica Secunda and were subordinate to the magister militum. 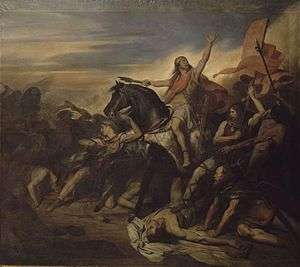 Clovis turned against the Roman commanders, however, defeating the Gallo-Roman ruler, and son of Aegidus, Syagrius in the Battle of Soissons (486), considered the end of Western Roman rule outside of Italy. 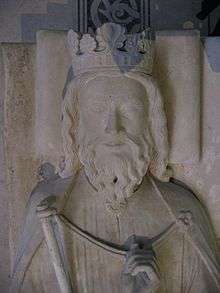 Clovis then had the Frankish king Chararic imprisoned and executed. A few years later, he killed Ragnachar, the Frankish king of Cambrai, along with his brothers. Another victory followed in 491 over a small group of Thuringians to the east. By this time Clovis had conquered all the Frankish kingdoms to the west of the River Maas, except for the Ripuarian Franks. He secured an alliance with the Ostrogoths through the marriage of his sister Audofleda to their king, Theodoric the Great. With the help of the Ripuarian Franks he narrowly defeated the Alamanni in the Battle of Tolbiac in 496. He made Paris his capital and established an abbey dedicated to Saints Peter and Paul on the south bank of the Seine. In 500 Clovis fought a battle with the Burgundian kingdom at Dijon but was unable to subdue them. He gained the support of the Armoricans (Alans, Gallo Romans, Britons) in the following years, for they assisted him in defeating the Visigothic kingdom of Toulouse in the Battle of Vouillé in 507, eliminating Visigothic power in Gaul. The battle added most of Aquitaine to Clovis' kingdom and resulted in the death of the Visigothic king Alaric II. 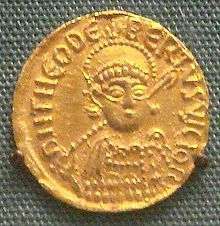 According to Gregory of Tours, following the Battle of Vouillé, the Byzantine Emperor Anastasius I granted Clovis the title of consul. Since Clovis' name does not appear in the consular lists, it is likely he was granted a suffect consulship. Gregory of Tours recorded the systematic campaigns following Vouillé to eliminate the other Frankish "reguli", or sub-kings, including Sigobert the Lame and his son Chlodoric the Parricide; Chararic, another king of the Salian Franks; Ragnachar of Cambrai, his brother Ricchar, and their brother Rignomer of Le Mans. Clovis became the first king of all Franks in 508, after he had conquered Cologne, capital of the Ripuarian Franks. Clovis converted to Catholicism at the instigation of his wife, Clotilde, a Burgundian princess who was a Catholic in spite of the Arianism that surrounded her at court. 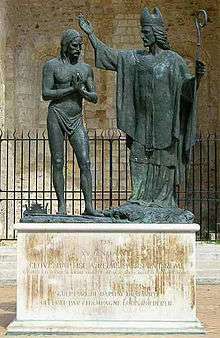 He was baptized on Christmas Day, 508, in a small church in the vicinity of the subsequent Abbey of Saint-Remi in Reims; a statue of him being baptized by Saint Remigius can still be seen there. Clovis and his wife were buried in the Abbey of St Genevieve (St. Pierre) in Paris; the original name of the church was the Church of the Holy Apostles. The followers of Catholicism believe that God the Father, Jesus and the Holy Spirit are three persons of one being (consubstantiality), as opposed to Arian Christianity, whose followers believed that Jesus, as a distinct and separate being, was both subordinate to and created by God. 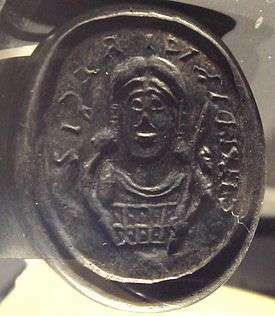 While the theology of the Arians was declared a heresy at the First Council of Nicea in 325 AD, the missionary work of the bishop Ulfilas converted the pagan Goths to Arian Christianity in the 4th century. By the time of the ascension of Clovis, Gothic Arians dominated Christian Gaul, and Catholics were the minority. The king's Catholic baptism was of immense importance in the subsequent history of Western and Central Europe in general, for Clovis expanded his dominion over almost all of Gaul. Clovis had adamantly refused to convert from Arian Christianity to Catholicism. Clotilde had wanted her son to be baptized, but Clovis refused to allow it, so Clotilde had the child baptized without Clovis's knowledge. Shortly after his baptism, their son died, and his death further strengthened Clovis's resistance to conversion. Clotilde also had their second son baptized without her husband's permission, and this son got very ill and nearly died after his baptism. Catholicism did offer certain advantages to Clovis as he fought to distinguish his rule among many competing power centers in Western Europe. 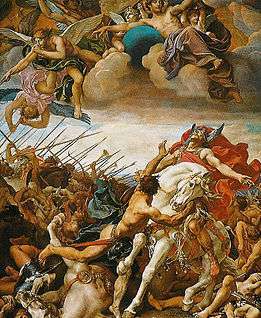 His conversion to the Roman Catholic form of Christianity served to set him apart from the other Germanic kings of his time, such as those of the Visigoths and the Vandals, who had converted from Germanic paganism to Arian Christianity. His embrace of the Roman Catholic faith may have also gained him the support of the Catholic Gallo-Roman aristocracy in his later campaign against the Visigoths, which drove them from southern Gaul in 507 and resulted in a great many of his people converting to Catholicism as well. Nevertheless, Bernard Bachrach has argued that his conversion from Frankish paganism alienated many of the other Frankish sub-kings and weakened his military position over the next few years. In the "interpretatio romana", Saint Gregory of Tours gave the Germanic gods that Clovis abandoned the names of roughly equivalent Roman gods, such as Jupiter and Mercury. Taken literally, such usage would suggest a strong affinity of early Frankish rulers for the prestige of Roman culture, which they may have embraced as allies and federates of the Empire during the previous century. William Daly, more directly assessing Clovis' allegedly barbaric and pagan origins, was obliged to ignore the Gregory of Tours version and base his account on the scant earlier sources, a sixth-century "vita" of Saint Genevieve and letters to or concerning Clovis from bishops and Theodoric. ↑ Alain de Benoist, Dictionnaire des prénoms, d'hier et aujourd'hui, d'ici et d'ailleurs, p. 294, éd. Jean Picollec, 2009. ↑ Chisholm, Hugh, ed. (1911). "Clovis". Encyclopædia Britannica. 6 (11th ed.). Cambridge University Press. pp. 563–564. ↑ Danuta, Shanzer (March 1998). 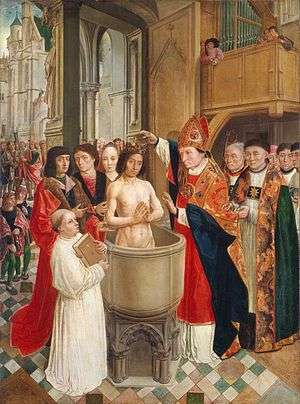 "Dating the baptism of Clovis: the bishop of Vienne vs the bishop of Tours". Early Medieval Europe. 7 (1): 29–57. Retrieved 7 September 2016. ↑ Rosenwein, Barbara (2004). A Short History of the Middle Ages. Canada: University of Toronto Press. p. 43. 1 2 "Iron Age Braumeisters of the Teutonic Forests". BeerAdvocate. ↑ Danuta, Shanzer (March 1998). "Dating the Baptism of Clovis: The bishop of Vienna vs the bishop of Tours". Early Medieval Europe. 7 (1): 29–57. Retrieved 7 September 2016. ↑ Geary, Patrick (2003). Readings in Medieval History: Gregory of Tours History of the Franks. Canada: Broadview Press Ltd. p. 153. ↑ Geary, Patrick (2003). Readings in Medieval History: Gregory of Tours History of the Franks. Canada: Broadview Press Ltd. pp. 145–146. ↑ Robinson, J.H. (1905). Readings in European History. Boston. pp. 51–55. ↑ Geary, Patrick (2003). Readings in Medieval History:Rome Law. Canada: Broadview Press Ltd. pp. 129–136.